When I published my first novel in September, I used the services of Pronoun Publishing. The experience was awesome. Pronoun converted my manuscript seamlessly into a high-quality e-book, and they handled the distribution to pretty much every e-book platform around the world. Some people in and around the indie author’s world were suspicious of Pronoun, saying it was too good to be true. Sadly, it turns out they were right. Pronoun recently announced that their business model is unsustainable, they will be closing up shop, and all the books they have published, including Last Call at the Ringrose Pub, will be taken off the market as of January 15, 2018. So, regretfully, I’m in the process of looking at other options. And sometime in the next six seeks, I will be moving Ringrose over to different distributors. The book will probably be off the market for a brief period while this transition is happening. I’ll let you know. Update (July 29, 2018) After a brief period listing the book on many platforms using a different distributor, I have recently republished the book exclusively on Amazon. It is now available to Kindle Unlimited subscribers. My second novel, Flash Drive, has been accepted into the Amazon Scout program! Some good news. My second novel, Flash Drive, has been accepted into the Amazon Scout program, a “reader-powered publishing platform for new, never-before-published books”. Here’s how it works. During any given 30-day period, a dedicated group of readers review all the available books on Scout and nominate a maximum of three choices for publication by Amazon Kindle Press. The first fifty pages of Flash Drive will be available on Scout until December 16th. Hopefully, hundreds of readers will nominate the book. More nominations mean better visibility, and that means a better chance for publication. At the end of the 30-day period, the book might be selected for publication by Kindle Press. This would be fantastic. Flash Drive would be supported by Amazon’s powerful marketing tools, which guarantees visibility, sales and reviews. It also means a $1500 US advance, and a 50% royalty rate on sales over $1500. From what I can tell, almost all previous Scout winners have done very well indeed. Do me a favor: help a poor struggling author. Click on the link, check out the preview, and nominate Flash Drive for publication. You’ll get a nice thank-you note. And if I get published, Amazon will send you a free copy of the e-book. Author petercfosterPosted on November 16, 2017 July 28, 2018 Categories UncategorizedLeave a comment on My second novel, Flash Drive, has been accepted into the Amazon Scout program! If you live in Montreal, you can save on shipping charges by contacting me here, and I’ll arrange to get you a copy somehow. In fact, if you promise me a review on Amazon or Goodreads, I’ll get you a free copy, no matter where you live. Contact me here. Of course, the e-book version is still available for download on Amazon at a bargain price: $2.99, no pesky shipping charges. To pick up a copy, just click here: Amazon.com, or Amazon Canada, or Amazon UK, or Amazon Australia (or find it in any of Amazon’s stores world-wide). Author petercfosterPosted on October 21, 2017 October 22, 2017 Categories UncategorizedLeave a comment on Is Last Call at the Ringrose Pub a historical novel? Author petercfosterPosted on October 5, 2017 November 12, 2018 Categories UncategorizedLeave a comment on Last Call at the Ringrose Pub: Five-star review on Amazon! Available for $2.99 on Amazon. Click a link to check it out and pick up a copy: Amazon.com, or Amazon Canada, or Amazon UK, or Amazon Australia (or find it in any of Amazon’s stores world-wide). Hello, and welcome to the web site of Peter C. Foster: author, writer, and erstwhile taximan. There are just too many Peter Fosters out there to be googled. I find refuge as one of the very few Peter C.’s. So far. I am the author of three novels, all written in the last few years, all set in present-day Montreal. I wrote the first to see if I could. The answer is yes. 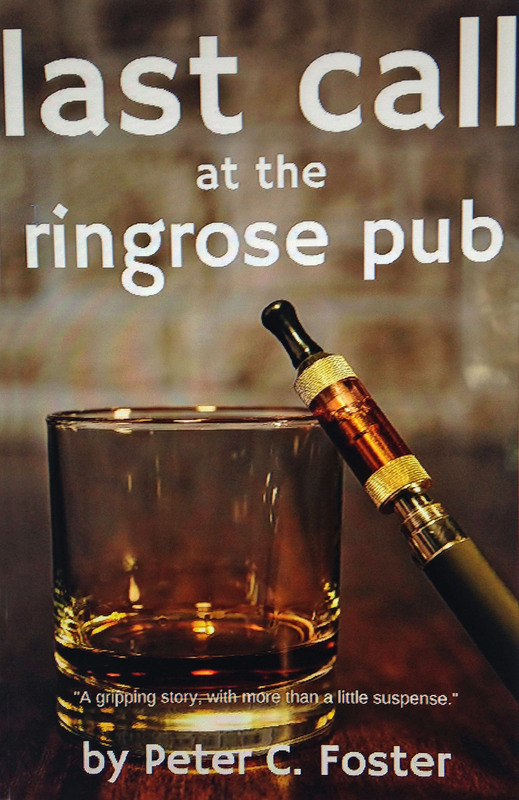 Last Call at the Ringrose Pub has recently been published and is available on multiple platforms for $2.99. I wrote the second because I thought the story might be commercially successful. I plan to publish this one sometime later this year. Finally, I wrote the third, simply because I liked the story and wanted to tell it, with no idea if it could find an audience. This one I hope to publish sometime next year. What else? I wrote and published my first story when I was twelve. (Total run, 1 copy, front cover art work by me, read by my classmate and my brother.) Since then, over the years, I have also produced some short stories, a couple of poems, even a play. All unpublished, of course.